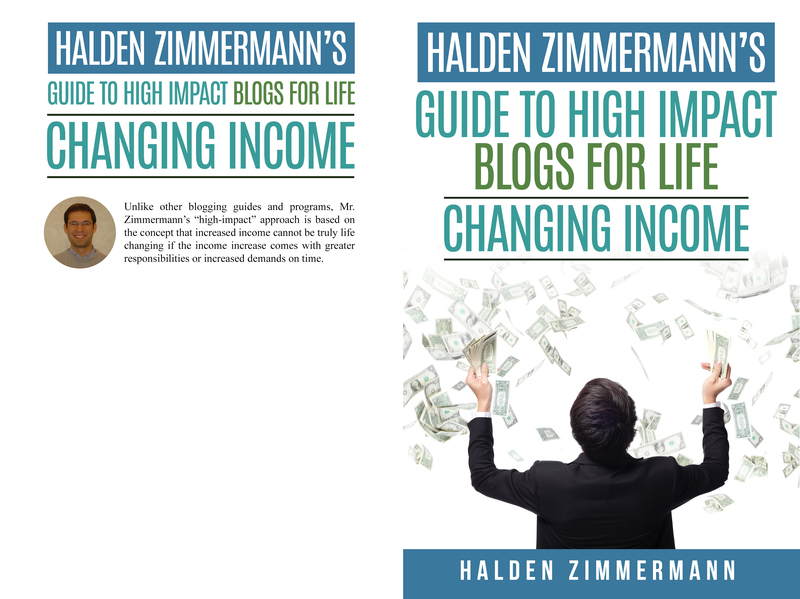 I just read Halden Zimmemann’s Guide to High Impact Blogs For Life Changing Income. I got the paperback version. It is a good read. It has some basic information about how to start, set up, establish, and run your blog. He gives good advice on start up information, lists some strategies for maintain a blog, and has a good understanding of the basic information needed to get started blogging. I found the information to be more of a beginners level. I have been blogging for about a year now and most of the information I found I already knew. I would say if you are just getting started or thinking about starting this would be good. What I thought it was missing was information about making life changing income. I expected there to be a lot more information about monetizing your blog. I only found a small amount of information on this topic. I was a little disappointed with the little amount of information I found. So I give this a four star because it does have some good basic knowledge and advice for beginners but I can’t say 5 stars cause I think it really left a lot to be desired. In his newest book release, Halden Zimmerman, a successful blogger with a wealth of professional experience in mechanical engineering and corporate leadership, discusses the methods and techniques aspiring bloggers can apply as they seek to achieve long-term financial security through their blogging career. With the release of “Halden Zimmermann’s Guide to High-Impact Blogs for Life-Changing Income,” beginner and veteran bloggers alike are able to benefit from the unique and data-driven approach developed by Mr. Zimmerman with the explicit goal of creating a stable source of life-changing income. Unlike other blogging guides and programs, Mr. Zimmerman’s “high-impact” approach is based on the concept that increased income cannot be truly life changing if the income increase comes with greater responsibilities or increased demands on time. The goal of high-impact blogging is to generate a significant source of income that only requires an initial investment of time during the planning and implementation stages. Once the blog debuts and begins to earn income, an effective high-impact blog will consistently generate revenue without demanding a continued time commitment. Through practical advice and personal insight gleaned from his first-hand experience as a blogger, Mr. Zimmerman espouses a step-by-step approach that begins with the pre-planning stages and concludes with the explanation of several strategies for expansion to platforms beyond blogging. Detailed explanations of commonly overlooked technical aspects abound, and Mr. Zimmerman outlines a strategy that clearly values the establishment of a strong foundation based on a thorough planning process. The attention to detail recommended by Mr. Zimmerman throughout the planning stages is critical for bloggers seeking to create a passive source of income through their blogging platform. Created with beginners in mind, Mr. Zimmerman’s book does not overlook the needs of veteran bloggers in the process. The information provided in “Halden Zimmermann’s Guide to High-Impact Blogs for Life-Changing Income” is presented in a simple and straightforward manner so blogging neophytes will have little trouble understanding and implementing the recommended strategies, but the concepts are such that they can benefit even the most seasoned blogging professional. You can purchase is on Amazon!